A 10” bass speaker is bubbling and humming away. But we can’t actually hear it, only see and feel its constant rumbles and vibrations. This is not a normal speaker, either: there’s no casing at all. 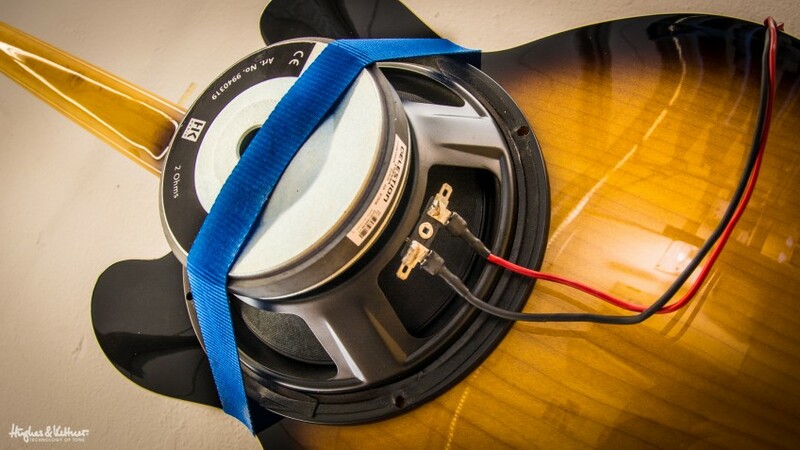 Rather, the speaker itself is attached to a sturdy strap, which is in turn attached to a rather sad looking electric guitar. As the speaker rumbles away, this weird construct vibrates and wobbles in time. It’s kind of like a grisly medieval torture scene, because the odd guitar/strap/speaker assembly is also suspended in mid-air via some ropes, so it can swing freely. There’s a method to the madness, though. Allegedly, you can use this weird technique to artificially age a brand new guitar 50 years in two weeks, imbuing it with a half century of mojo simultaneously. Instant old-school sound! Oh, and yes, while we’re at it, we’ll get our amp’s caps replaced with gold-plated versions too! Just think of the coolness. This is gear that only works best under a full moon. Hmm, or should that be a new moon? Besides premature midlife-crisis sufferers, high-end hi-fi disciples and qualified esotericists though, there’s no group more susceptible to this so-called Voodoo Gear logic than guitar players. There are actually guitarists out there who can apparently – and without a hint of irony or humor – identify what kind of batteries have been put in their FX pedals just by listening to the guitar being played. The question is: are you a Duracell or a Varta fan? But is this really Voodoo? Does Voodoo even exist? Or is it just a brilliant marketing ploy that seduces us into buying and using “must have” bits of gear? Whether the supposed Voodoo magic that surrounds our musical kit is really there or not is a constant source of heated debate. Just like the myth that has elevated vintage guitars from the 50s and 60s into ridiculous price brackets. Are they really as good as we’re all led to believe? And if yes, why weren’t they treated as such back in the day, when they were fresh and new and didn’t cost the same as a small house? OK, these guitars were decent working tools that felt good, played well and got the job done just fine – but they were certainly not given the magical aura they enjoy today. It’s just that in the time since, we’ve got it into our heads that the decades of use and abuse have made them something special. And when you listen really, really closely, you can hear it, can’t you? Something truly original and authentic. Or at least you thought you heard it. Was there something? Of course! When your guitar costs more than your car did, you’ve got to hear something. Anything! Just to not overcook this, here’s an aside from a friend of ours who spent years working as a technician with a high-end speaker manufacturer. How high end? Try this: a pair of these speakers can easily cost the same as a well kitted out new Porsche. So yes, we’re at the higher end of high-end here. The Voodoo topic often came up in conversation with our friend, of course, because of the whole question of why you’d spend so much on hi-fi speakers. And the lack of understanding seemed to increase in line with the amount of investment! If you can hear the difference, you’re right! Simple, really. Everyone’s free to buy what they want, or can afford. The reason for all this, after all, is to get the best possible result – and the best possible sound – you can that’s within your means. Now, if we’re being objective, this can only be a good thing, because ultimately, we – you, me, us, the crowd – are the ones who also participate in the ego trip of the musicians we go to see. And, under controlled conditions, the sheer amount of money musicians have spent on their setups might make everything appear to sound better. The question of whether Voodoo Gear exists is moot. What’s for sure is that many of us guitarists have an unquenchable thirst for new toys as and when(ever) we can get our hands on them! It’s the Voodoo sufferers among us who then stick their new pieces of kit through procedures like the one in the picture. Chris, a guitarist friend of ours whose talent, financial situation and love of rather expensive Voodoo-esque gear has led to a number of related jokes over the years, has regularly played an annual town festival with his band in our area. Chris always had the best of the best when it came to gear: a “10-Top” PRS axe, a boutique USA-made amp with only the most exorbitant tubes money could buy, and more along those lines. Added to this setup was a 230-volt multiple power strip with silver-plated contacts – from a high-end supplier, of course – and the amp was fitted with no less than gold caps. Oh, and I forgot to mention that the PRS had been ‘authentically’ (yet artificially, of course) aged thanks to a highly complex and expensive process that would take the instrument’s sound to sublime levels, apparently. Like that one in the intro to this post, perhaps. Anyway, in the practice room, Chris had a great, fat guitar tone. His hideously expensive axe sounded crisp and juicy, full of attack, and the amp complemented it perfectly, providing a wonderfully dynamic sound with next to no extraneous noise. Maybe it was just a case of him always playing out of his skin, or was the tone from his fingers too? Whatever it was, Chris was a big deal in our neck of the woods, and he always sounded hot! But on the night of the big show, something was amiss with Chris’s sound. Did the FOH engineer have a bad day at the office? In the mix, the guitar was way too quiet, and on the odd occasion you could actually hear any six-string at all, it was thin, limp and fizzy. All this, Chris later told me, could have had something to do with the complex lighting system the festival organizers were using. Maybe he was right. Maybe not. Bow down to the fabled gold caps! Or don’t, it’s your choice. 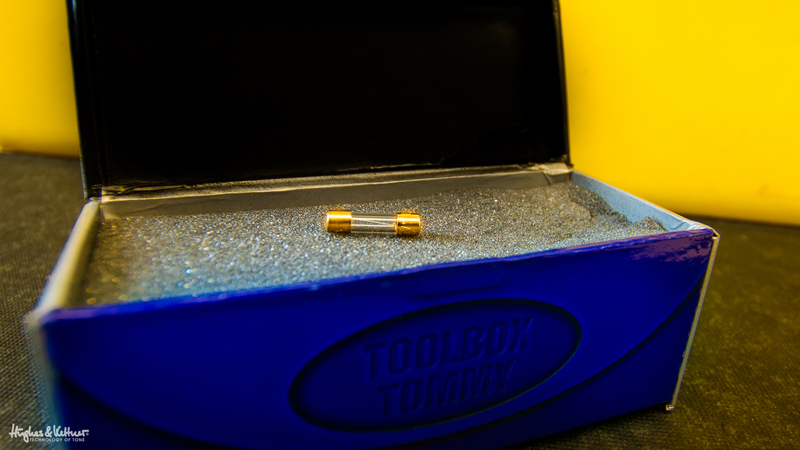 They might look amazing, but is anyone really going to notice if you get these put in your amp? In any case, the hustle and bustle of the festival – the show must go on, right? – meant that finding the problem on the fly was difficult, and eradicating it during the band’s set was impossible. The guitar sound was so painful, it spoiled the gig completely. For Chris himself, the effect was worse: he was distraught for a long period afterwards, and didn’t play again at all for some time. The bottom line is this: Voodoo or not – there are plenty of ways to spend money in the guitars and amps world, and you should probably think twice about whether those gold caps and high-end plugs are really going to be your cure for the dreaded “Equipmentitis” – we need to honestly ask ourselves whether, at the end of the day, this accumulation of expensive gear really brings added value to our playing and sound. Does it genuinely make us better than we were before? An exquisite rig certainly didn’t save Chris’s blushes. Because this is the sad truth at the end of the day: the short-term self-pleasure that Voodoo Gear brings about is only useful to one person – the manufacturer of the miracle cure! Which really works wonders, by the way. First published: September 05 2014. Most recent update: August 21 2015.
too many players GAS over the “vintage” sound but if they ever land “vintage” equipment they play anything but “vintage” with it and are left unpleasantly dejected because their choice of Magical Mojo didn’t fill the void they thought was present. Most people have a dream sound they want to hear when they play but fail to realize that sound starts in their minds and is executed by their fingers. all of the guitars, amps and effects made by man cannot yield the golden tone unless the person holding the instrument is capable of playing it. I know of many people who have gone through several rigs in hunt of an elusive sound. They end up settling for a tone that is usually annoying because they don’t know their rigs and it sounds like crap. The rest of the band suffers because of such. I learned long ago to adapt myself to what I had because it starts with me. Thanks Victor, and interesting to hear of your experiences too! We think it’s a combination of all those factors really, and as long as you sound like you want, you should be happy. Oh, and of course if that involves using one of our amps, even better 😉 Have fun with your GrandMeister! Cool we agree that at least us mortals can have more fun with better gear (and might it be for the placebo effect). I guess we are agreeing to disagree on the Clapton point though. Having heard him on Soldanos, Twins and different boutique amps, I very much heard different sounds from the same fingers. Of course his fingers could have been in Soldano mode on the Soldanos 😉 But until I have a spare Mr. Clapton to proof I guess we will have a different opinion here. (btw, same goes for Gary Moore and many other GREAT players. They all sound very much different on different gear, even if “their” characteristics will remain (e.g. bendings, how the hit the strings etc.). Dismissing all expensive (and what exactly is expensive; is a tube head about 500$ expensive) things and the buyers is as wrong as the other way around (hence stating cheap gear does not sound well). Unfortunately you have to find out yourself which are working and which not (because enough are snake oil as in all industries). There is no doubt about that as well. Even when Clapton sounds great through some mediocre gear (and in the video I haven’t heard he was using bad gear; it just wasn’t vintage, boutique,…), he sounds even better when he uses great gear. And some good gear is expensive (some isn’t). This is the most ridicolous point of them all. Not only it hints that players who play expensive gear are playing bad (sorry George Lynch, you are out now) but it misses the point completely. A better player always sounds better than a bad player. Of course! But this doesn’t tell anything about the effectiveness of his gear. So again the better player sounds better with the better gear then he sounds with bad gear. And even the bad player sounds better with better sounding gear than with bad sounding gear. Of course this does not compensate for playing (in)abilities. So what is the point? … no matter how good or bad it was before. If the sound guy is not good, the surroundings (room etc.) are bad it can kill your sound. But it does it anyways. So what is the point. Start with bad sound from the beginning so you won’t be disappointed (and sound bad even if the sound guy is good)? Really? It’s the sum of all parts that give the resulting sound. 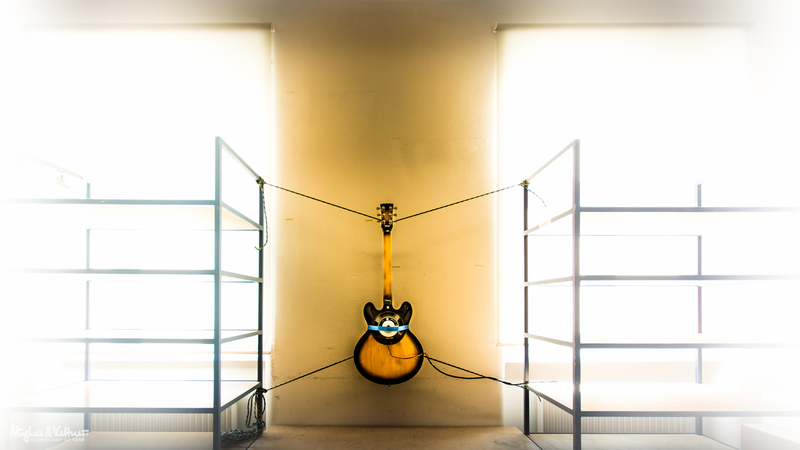 From player to guitar to amp, … to mix and room. Hey Alex, geat reply – probably the most detailed we’ve ever had! And you’re right about the Chris story too – it could indeed have been the surroundings that killed his guitar sound at the gig. But the point there also was that the best gear didn’t save him any more than a $100 Strat copy and start amp would have. Thanks for reading, and hopefully we’ll see you again in our blog comments soon! The emperor has a new set of clothes…..
Screw the speaker strapped to your guitar just get a Primevibe! By the way I love my Tubemeister 36.